We love The Little Gym! Such a great gymnastics/dance studio in Colonie. 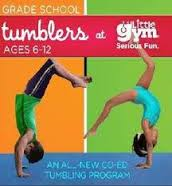 This Friday night, October 3rd, they are offering a free class for grade school kids aged 6-12 at 5:15 PM. Sign up for their FREE Sample Session by calling 518-729-3230. Members and Non Members Welcome!